The eldest brothers, Otto and Gustav, first operated the Jesiek Boat Livery at 315 S. Market ca 1903-04 according to the city directory. 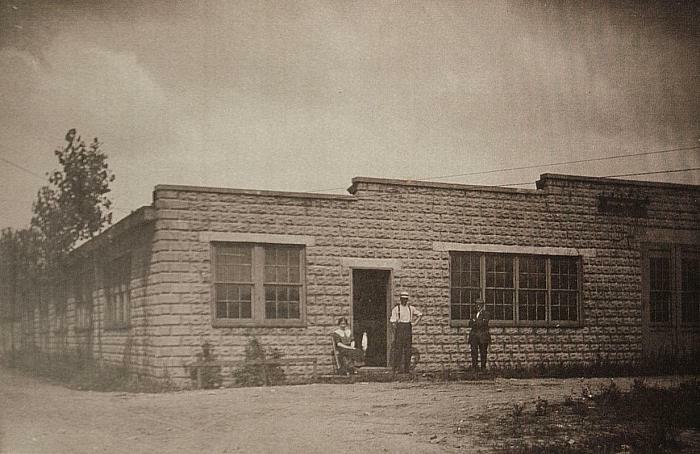 However, their letterhead says, "Established in 1901." Family members recall that the livery built and rented rowboats, did boat and motor repairs, provided dockage and pulled and stored boats high on the earth dikes along the river prior to the cement flood-walls being put in. Since the brothers were all working in other jobs at that time, perhaps they operated the livery on week-ends when people would have had time to enjoy boating on the Grand River. 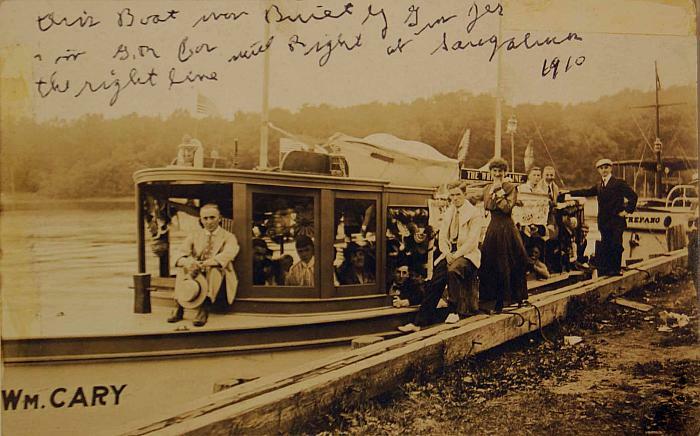 In 1905 the Grand Rapids-Lake Michigan Transportation Co. built two sternwheeler steamboats, the "Grand" and the "Rapids," across the river from the Jesiek Boat Livery. Did some of the brothers work during that year constructing the steamboats? Maurice J. Godfrey, a marine architect and master ship carpenter from Clinton, Iowa, was the superintendent of the project. The Jesieks would have had ample opportunity to learn boat building techniques from Godfrey. 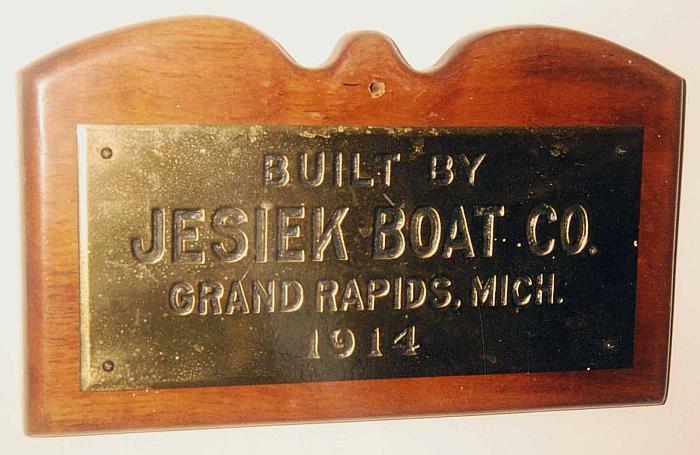 The following year, in 1906, Gustav and Joseph Jr. are listed as owners of the Jesiek Boat Co. at 2-4 Wealthy St. and Rudolph is listed as a boat builder for the company. By 1908 brother Otto also works with them, and they have produced a 32 page catalog. A long arrow, running the full length of the boat, became the trademark of the Jesiek boat. The brothers certainly found time to play. There was a group known as "The Grand River Rat Club," a community of young men who were boat owners or involved in boating. 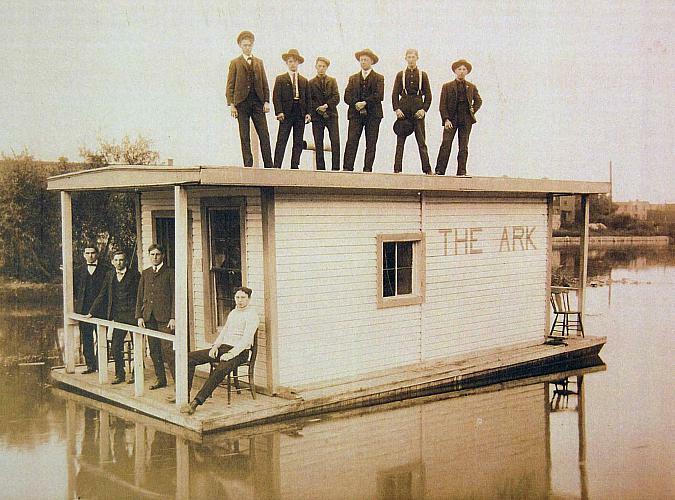 They met and partied in The Ark, a makeshift houseboat that belonged to the Jesiek brothers. By 1912 Otto and Joseph Jr. had opened a boat livery on Lake Macatawa (then known as Black Lake) with a $500 loan from brother Rudolph. The Jesiek Boat Co., now owned by Gustav moved to a new and larger location at 79-91 Market SW. His sister Anna was bookkeeper and secretary. That same year the GR Herald of December 20, 1912 reported the tragic suicide of their mother, Mary Jesiek. The company states in catalogs that they are able to fill orders for boats 25-75 feet in length. In addition they provide the following services: yacht chandlery, special fittings, winter storage, and mechanics. 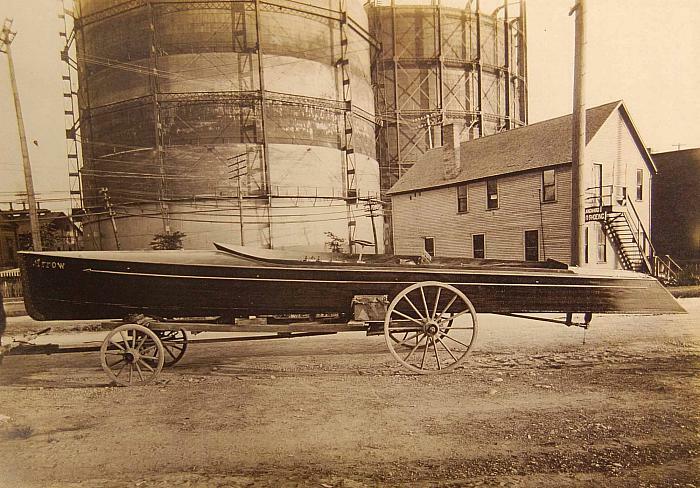 Some of Gus's boats and engines were shipped to Cuba, South America and Australia. The last record of the Jesiek Boat Co. is in 1920 although Gus still listed himself as a boat builder in several city directories after he was out of the business. Descendants think perhaps he stopped production because he couldn't compete with the production of speed boats by Gar Wood, and possibly Christopher Columbus Smith--forerunner of Chris Craft. Grand Rapids Historical Commission and the Community Media Center present Glance at the Past. This week's episode focuses on the FIRST Wealthy Street Bridge. Chrysler, C. Donald. 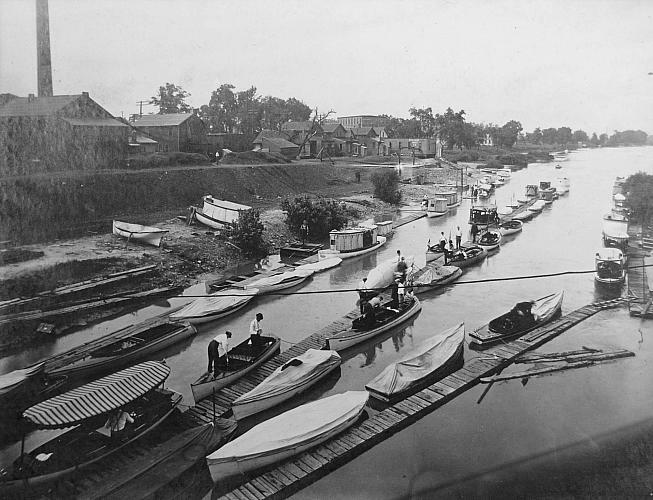 The Story of Grand River: A Bicentennial History. Grand Rapids, MI: Printed by Grace Publications, 1975. Curwood, James Oliver. The Great Lakes: The Vessels That Plough Them, Their Owners, Their Sailors, and Their Cargoes: Together With A Brief History of Our Inland Seas. New York: Putnam, 1909. Seibold, David H. Coast Guard City, U.S.A.: A History of the Port of Grand Haven. Ann Arbor, MI: Historical Society of Michigan, 1990. Sherman, Elizabeth, B. Beyond the Windswept Dunes: The Story of Maritime Muskegon. Detroit: Wayne State University Press, 2003. From Grand River to Macatawa Bay: Jesiek Brothers—Famed Name in Boat Business for More Than 50 Years. Peninsula Club Magazine, May 1963. 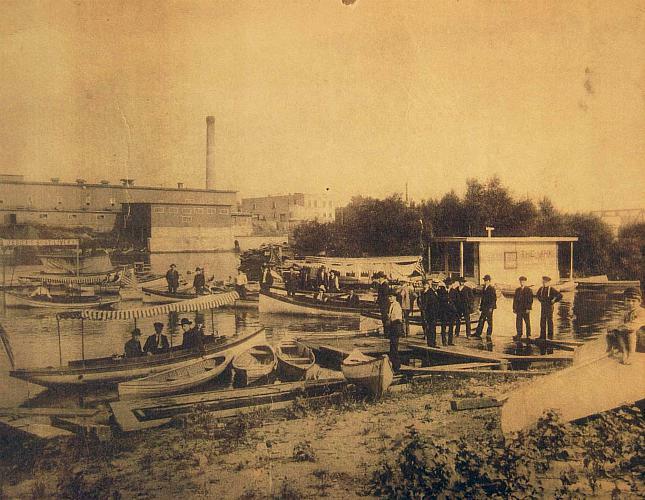 Article on Grand River Steamboats. Grand Rapids Press, April 25, 1971.